The human being has dignity and a transcendent dimension, and this is why an independent moral authority, such as the Holy See, has a role to play in international organizations, says an official at the Vatican Secretariat of State. Monsignor Pietro Parolin, undersecretary for relations with states, affirmed this in a conference delivered Nov. 21 to a group of ambassadors and members of diplomatic corps gathered in the Argentinian Embassy to the Holy See. The gathering marked the 150th anniversary of the establishment of diplomatic relations between the Holy See and that nation. “The Catholic Church is the only religious institution that can enter into diplomatic relations and that interests itself in international rights, acting through the Holy See, an international sovereign subject of singular characteristics," Monsignor Parolin said. He explained that an adequate understanding of the Holy See, as such, requires two distinctions. First, one must bear in mind that the Holy See cannot simply be identified with the Church, as a community of believers. And second, it cannot be identified with Vatican City State, a geographical place that assures the freedom of the Roman Pontiff. “The Holy See is the Holy Father himself inasmuch as he is an independent, universal, spiritual authority, together with the organizations of the Roman Curia that collaborate with his mission,” he defined. The Holy See thus requires a particular status, such as that given by the definition of “subject ‘sui juris,'" meaning the Holy See defines for itself its juridical organization and does not receive it from outside, and as such, can enter into relationship with other states. The Holy See currently has diplomatic relations with 176 states. It has a presence at the United Nations as an observer state, membership in seven organizations or agencies within the U.N. system, and is an observer in another eight. The Holy See also has observer status in five regional organizations. The “tenacious” assertion of its own international personality and the petition of the Holy See to intervene in international policy debates in order to offer its contribution is far from an interest in safeguarding its own independence, underlined Monsignor Parolin. If the Holy See wishes to place itself as “an independent interlocutor of the states and to express an authorized judgment about the problems that affect lives,” it is because “it thinks that it represents a dimension of man that, although decisive in the life of the societies, is not fully under the jurisdiction of the states, nor does it end in them," he said. "There exists," the monsignor affirmed, "something that goes above and beyond the material element." The key, he explained, is the dignity of man, which is prior to the existence of the state. Respect for this dignity is the thermometer of the legitimacy and justice of any legal norm. And “this dignity of the individual has as an essential element the transcendent dimension [of man]," he said. "If man did not transcend the material dimension, there would not be sufficient reason for the respect of his dignity to be over and above national interests," observed Monsignor Parolin. "This pre-existence and independence of the dignity of the individual, and more concretely, his transcendent dimension, is the ultimate justification for the existence of a sovereign moral authority independent of the states." "As a consequence, the Holy See, in its international activity, without interfering in the realms and responsibilities proper to the states, proposes itself as guardian of the human person and religious liberty," Monsignor Parolin continued. 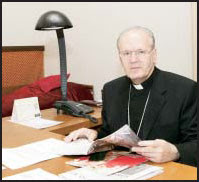 The Vatican official said that working in the Secretariat of State, especially in the section for relations with states, implies having the advantage of a unique watchtower from which to observe and know the international reality, given that one is privy to a constant overall vision formed in part by an almost daily contact with the diplomats accredited to the Holy See. And guiding the activities of the Holy See in the international realm is what Monsignor Parolin called "the binomial of person-truth." The Holy See, he said, "attempts to emphasize these concepts, making use of the very tools provided by the international community, such as the manifesto of the United Nations, which solemnly declares that the organization was established in order to save future generations from the scourge of war, in order to reaffirm the faith -- a key word -- in the fundamental rights of man, in the dignity of the human person, in order to ensure the respect for international rights and to promote social progress." The significant use of the term “faith” in the cited context, enabled the Holy See, in the last U.N. debate, to observe "that the existence of a universal, transcendent truth about man and his intrinsic dignity was affirmed, [a truth] that is not simply a historic creation, but is rather a reality that precedes and determines all political activity," such that “no ideology of power can suppress such truth," the monsignor recalled. “The Holy See emphasizes constantly that respect for the dignity of man, therefore, is the deepest ethical foundation for the search for peace and in the building of international relations," Monsignor Parolin affirmed. "The lack of, contempt for, or partial adhesion to this principle is the origin of conflicts, of environmental degradation and of injustices."